This week on Guest Blog Wednesdays at The Australian Bookshelf we are joined by author, Natasha Larry. She has put together an aweseome character interview for her novel Darwin’s Children. Hi, Natasha Larry here. I’d like to introduce one of my biggest fans, and fiancé Dave Dorr, who recently interviewed one of his favorite characters from Darwin’s Children, John Gramm-President of the Gramm Institute in Gurley, Alabama. Q: So, John, tell me a little bit about yourself and what you do. A: (John grins goofily) Well, I am a researcher of all things paranormal. My main focus is on the developmental evolution of the human brain, especially in regard to its correlation to superhuman abilities. Interesting, can you share some of your findings with us? What is it, in your opinion, that gives people superhuman abilities? I’d be happy to. My research has lead me to the conclusion that superhuman abilities are produced by a combination of an enlarged amygdala region-the area of the brain that controls emotion- and a properly timed, extreme emotional experience. In most cases, this experience is traumatic. This triggers a pulse, and awakens new areas of the brain, bringing about unique abilities directly related to the emotions that triggered them. Wow, what can you do, and would you mind sharing the event you believe lead to your own superhuman ability? Not in the least. I have, what you might call… a very persuasive personality. There seems to be a particular tonal quality to my voice, and when I focus my intent, I can make anyone do anything I wish him or her to do. I can also read bio-energy. My abilities manifested around the time I was fourteen years old. At that time I realized that Mason, my best friend, was one of the best people I’d ever known and that he would be my friend forever. I knew he was a telepath and that, in fact, he had one of the strongest energies I’d ever felt. He opened up to me about something very personal and I believe that had a lot to do with it. But, I’d rather not share the personal business of my family. Understandable. You mentioned that aside from the “trigger” experience, one must be born with an enlarged amygdala to have superhuman abilities. What happens if there is no trigger? Well, keep in mind that my research is relatively infantile. In my own experience, without a trigger there still seems to be some heightened intuition and a more efficient emotional response in these types of people. For example, in people with an enlarged amygdala who haven’t experienced the pulse, there is a general lack of what is called the “amygdala hijack,” response in the brain. This is a phenomenon that triggers a false fight or flight response, and has, as a result, kept us from evolving as a species. Without this handicap in the brain, emotions are purer and instincts actually have a chance to adapt and, eventually, evolve. Very cool. Now, let’s get to the juicy stuff. Have you ever used your ability to get your way with the ladies? (Sly smile) Wow, you’re not shy are you? Well, I was a teenaged boy once upon a time. We all know those little bastards will pretty much do anything to get the girl. Interesting. How would that make you feel if that were done to your goddaughter, Jaycie, or even… Haylee? Ahem, (clenches teeth) We should probably skip that question. Has Mason ever used his telepathy for less than noble ends? If he had, do you really think I’d tell anyone? But, of course, he hasn’t. What was it like having a hand in raising a young girl that will one day be the most powerful human being on planet? Well, I won’t lie. It’s a lot of pressure. Not that I would trade it for anything in the world. What is the most important lesson you handed down to her, as a second father? I think the most important lesson I taught her was to laugh and not take life too seriously. I’m goofy with her and encourage that silliness to a very important end. We’re talking about a girl that has spent up to twelve hours a day training her mind since the age of eight years old. For someone like that, silliness is important. The other important lesson I hope I instilled in her is that family always comes first. How important was Allison in teaching Jaycie to control her ability? Would you and Mason have been able to handle it on your own? Allison was key in Jaycie learning to control her telekinesis. There is no way in hell we could have raised her without Allison. Allison was essential in helping Jaycie learn control. As powerful as Mason and I are, we have no idea what its like to have to deal with unlimited power. Allison is the only other person on the planet that does. Plus… chick stuff. What ever happened to Jaycie’s own mother? Gotcha! Has there ever been any romantic inclination toward Allison on your part or on Mason’s part even? Allison is gorgeous! But she’s like… my great-grandmother! (hysterical laughter) seriously, if you tell her I said that, you’ll spend the rest of your life cleaning my house! In all honesty, she’s the closest thing I’ve had to a sister. Alright, tell me a little bit about Haylee. Why is it that her own Guardian didn’t protect her as a child, why send a seventeen year old kid to avenge her? I thought the Dey-Vah were the most powerful race on the planet. That’s a great question. They are certainly the most powerful. But, they also understand that there are certain things they can’t do for us without getting in the way of who we are meant to be. I speculate that one- the bond between Haylee and Jaycie was necessary, and that two- without… (clenches teeth) the horrible things that happened to her, Haylee would not have the ability she currently has. Without that ability, this whole Core business falls flat on its face. Can you explain to us what the Core actually is? Alright, one last question about Matt Carter: you two had a very tense moment when you caught him making out with Jaycie. Many people have expressed their desire to see the two of them together… do you think they will wind up back together. As much I understand that Matthew is a good kid… and possibly the best person for Jaycie… no godfather wants to see his baby with anyone. Especially someone who is that pretty and blonde. As for whether or not they will wind up back together: that’s really a question for Jaycie. I don’t think its realistic that they’ll make it as long as he has no idea what is happening, but I also have an annoying feeling that I haven’t seen the last of the little, blonde jerk-off. Thanks for your post Natasha, that was great! Now here’s a blurb about Natasha’s novel, Darwin’s Children. 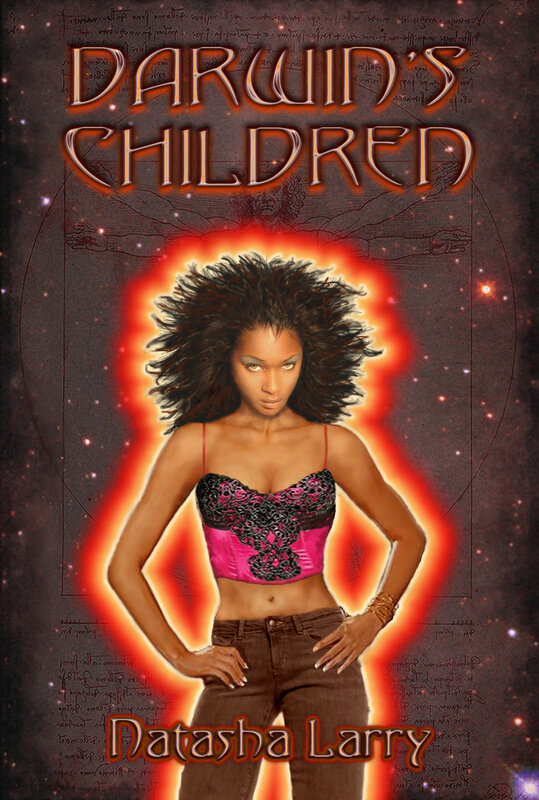 Darwin’s Children: Life can get pretty complicated for any seventeen-year-old girl, but for a home-schooled telepathic black girl trying to survive in a prestigious private school in small-town Jonesborough, Tennessee, it can be maddening – especially when her telepathic father keeps eavesdropping on her thoughts! That was a great ‘interview’! Thanks for sharing. This interview was fun! John is the sheezy!